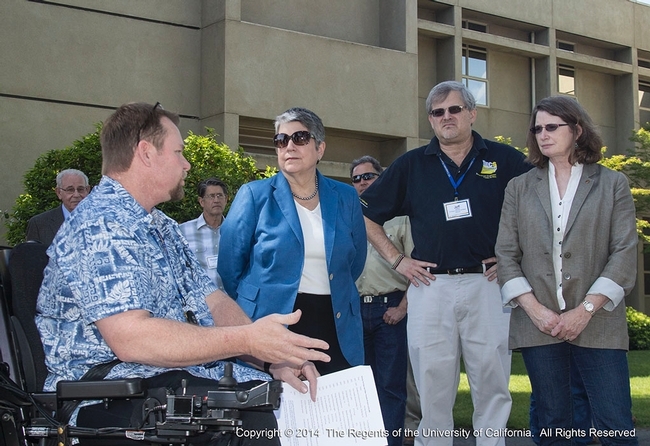 UC President Janet Napolitano and the President's Advisory Commission tour Kearney in April 2014. UC President Janet Napolitano and the President's Advisory Commission visited KARE on April 14, 2014. The stated purpose of the visit was to meet with the PAC to discuss issues facing agriculture and to visit KARE and learn more about what we do and the importance of our research and outreach. The President learned about the work we are doing to control mosquitos (Anton Cornel), our work to support small farmers and the blueberry industry (Manuel Jimenez), the use of AF36 to control aflatoxin in pistachios (Themis Michailides), and the importance of rootstocks (Louise Ferguson). The President and her PAC were engaged and enthusiastic about their visit to the Center. We also shared information on what we are doing to conserve energy and provided a general field tour. The Fresno Bee wrote an article on the visit. Anton Cornel shares information on his mosquito control research program with the UC president and her advisory commission. Manual Jimenez discusses his blueberry research and extension program with the UC president and her advisory commission. Themis Michailides discusses his work on AF36 with the UC president and her advisory commission. Louise Ferguson discusses the importance of rootstocks with the UC president and her advisory commission. Robert Ray and Jeffery Dahlberg discussed Kearney's energy conservation strategies and different field research projects conducted at KARE with the UC president and her advisory commission. 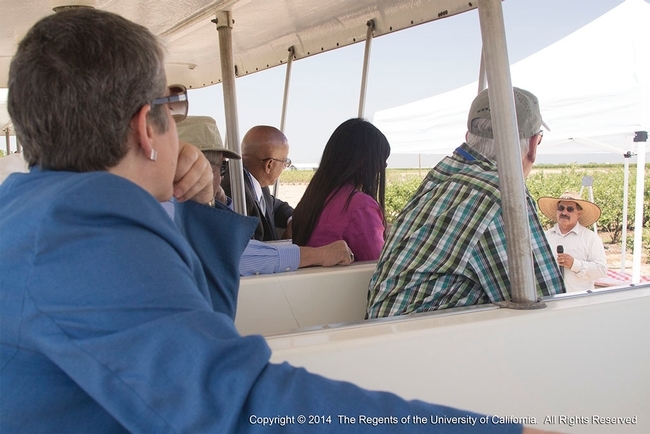 President Napolitano tours California agriculture. 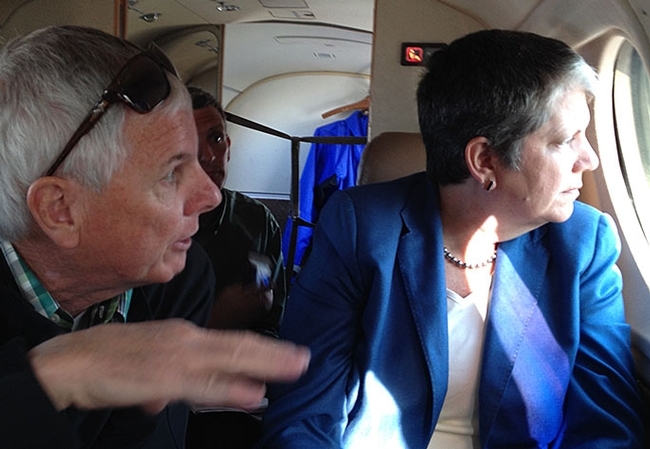 UC President Janet Napolitano received an in-depth briefing on California agriculture Monday (April 14), seeing firsthand the effects of the drought and learning about the university's efforts to help farmers increase water efficiency and improve crop yields. From Oakland, Napolitano took an aerial tour over the Sacramento-San Joaquin River Delta and across the Central Valley, viewing how California's vast heartland faces low reservoirs, brown hills and fallowed fields. She then met with her top agricultural advisers — the President's Advisory Commission on Agriculture and Natural Resources. They convened at the Kearney Agricultural Research and Extension Center in Parlier to discuss the impact of UC's research in agriculture and how to engage all 10 campuses in making UC the “go-to” institution in the world for all issues related to food, including sustainability and nutrition. Napolitano acknowledged that UC already does much but can do more. California's $45 billion agricultural industry leads the nation, with UC research playing a key part: developing new crop varieties, supplying rootstock for healthy plants, providing best management practices and finding sustainable solutions to the toughest challenges. “We are teaching the next generation of food scientists and we are researching how to make sure there is a sustainable food supply for the world,” Napolitano said. Kearney, 15 miles southeast of Fresno, is one of nine research and extension centers run by UC's Division of Agriculture and Natural Resources, serving as a base for dozens of scientists from UC Berkeley, UC Davis and UC Riverside and UC Cooperative Extension advisors and specialists. Kearney supports research on 45 crops from grapes to walnuts and studies issues from irrigation to mosquito management, with facilities including greenhouses, insectaries and postharvest labs, Director Jeff Dahlberg said. UC Cooperative Extension advisors and specialists are “a very integral part of our farming,” said Don Bransford, a rice, prune and almond grower who chairs the President's Advisory Commission on Agriculture and Natural Resources. “I know who my advisor is — they're the experts,” he said. 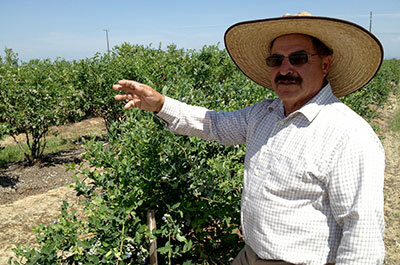 UC Cooperative Extension advisor Manuel Jimenez helped popularize blueberry growing in California. The postharvest facility is “extremely important” in helping to document food safety, added commission member Joel Nelsen, president of the California Citrus Mutual. 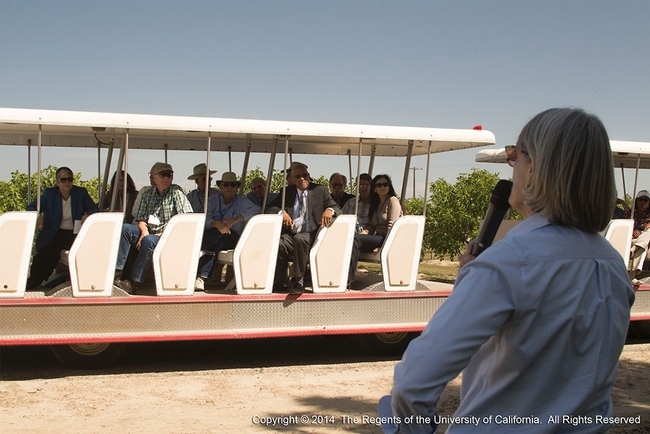 A field tour highlighted two crops in which UC has played a pivotal role: blueberries and pistachios. Twenty years ago, few blueberries were grown in California. Blueberries were considered a cool-weather crop, but UC Cooperative Extension advisor Manuel Jimenez had a hunch they could grow here. He tested different varieties and found that blueberries could thrive by acidifying the soils and maintaining acidic conditions in the irrigation water. California is now one of the leading producers of fresh blueberries, with growing concentrated in the Central Valley. “Blueberries love warm weather,” said Jimenez, who retired last year but still conducts blueberry research. Pistachios have become an increasingly important crop, valued above $1 billion a year. The United States is the world's leading pistachio producer, and 99 percent of the country's crop comes from California. Half of all pistachios in California are grown on rootstock taken from the mother pistachio tree at Kearney, said UC Cooperative Extension specialist Louise Ferguson. UC research has helped ensure the safety of pistachios through biological controls, said Themis Michailides, a UC Davis plant pathologist based at Kearney. Napolitano noted that she made the ANR vice president a direct report to her because agricultural issues matter to California and the world. Those issues include the drought. 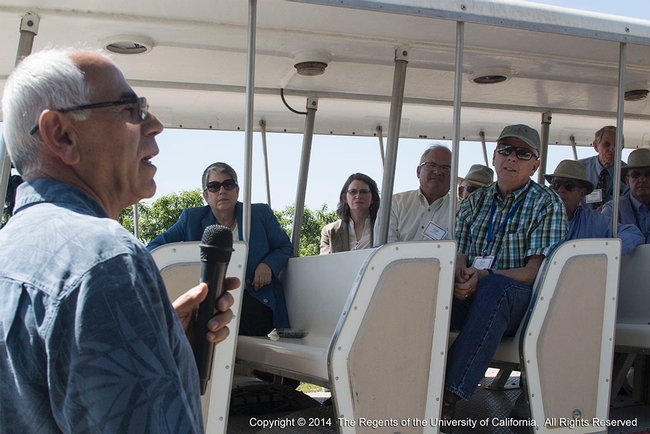 UC is putting its expertise to work, hosting 35 drought workshops in the past two months alone for farmers, ranchers and homeowners, said Doug Parker, director of UC ANR's California Institute for Water Resources, who served as a tour guide for the president. UC researchers have come up with recommendations to help farmers minimize water use while maximizing production, said UC Cooperative Extension advisor Roger Duncan. Still, it's estimated that up to 10 percent of California's farmland could be fallowed, primarily in the San Joaquin Valley. “A lot of lower-value crops just won't be planted,” Duncan said. The daylong briefing reinforced how UC is at the forefront of issues facing California agriculture, said Barbara Allen-Diaz, UC vice president for ANR. “It's great to see the incredible depth and breadth of California agriculture, and show the link between UC research and extension and the development of agriculture in the state,” Allen-Diaz said. UC helps students and teachers explore healthy food choices, learn how food is grown, interact with farm animals, and learn about careers in Agriculture. 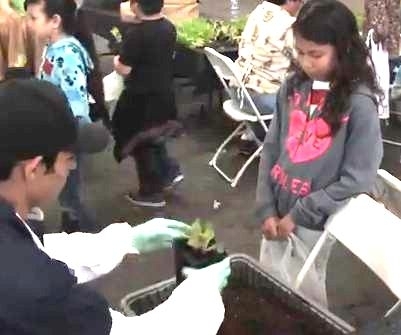 Over 3400 third-graders and 600 teachers and chaperones from nine Fresno County school districts attended Fresno Farm and Nutrition Day at the Big Fresno Fairgrounds on March 21, 2014. 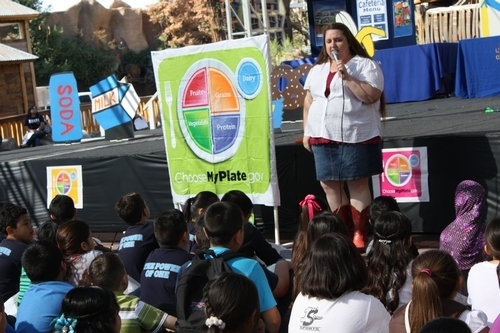 Over 50 stations with educational handouts, experiential workshops, presentations and displays helped increase participant awareness of nutrition and agriculture. Fresno County Farm Bureau organized the event with the help of several sponsors, volunteers and presenter groups. 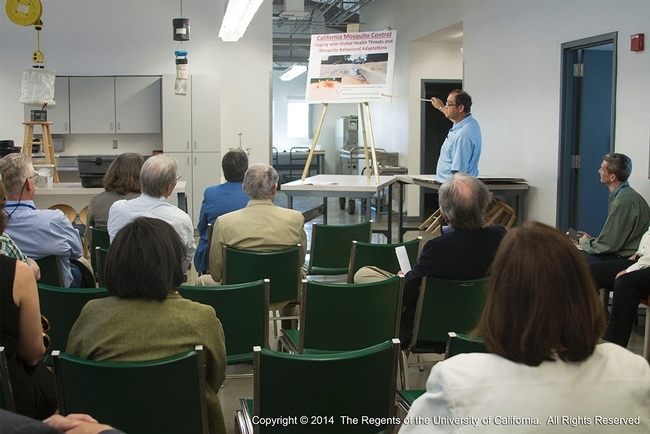 Three UC Agriculture and Natural Recourses units provided presentations, demonstrations and workshops. Fresno County UC Cooperative Extension provided presentations and demonstrations on healthy habits. Most of the students are from urban areas of Fresno, and have limited opportunities to interact with the agricultural community. Fresno's community 4-H clubs brought farm animals to interact with the students. Fresno County UC Cooperative Extension also displayed Southeast Asian vegetables and discussed Southeast Asian culture with the students. KARE provided short presentations on what it takes to be a healthy plant and what it takes to be a healthy person, followed immediately by workshops where the students planted leaf lettuce transplants to take home and enjoy. The workshops were made possible with donations and volunteers. Valley Soil & Forest Products donated soil, The Plant People donated pots, and Greenheart Farms donated lettuce transplants. Fourteen volunteers helped ensure that all of the participants were able to pot up and take home leaf lettuce plants. The UC Davis Veterinary Medicine Teaching and Research Center's Cardboard Cow visited event as well. She came with Jennifer Crook, Adrianna "Auggie" Villarreal, and Grant Jones-Wiebe. The children learned how a veterinarian uses tests and tools to diagnose a cow's welfare. They poked "inside" Cardboard Cow to touch and see her spine (styrofoam backbone), muscle structure (pink packing "peanuts"), four-compartment stomach (small rubber-, volley-, soccer-, and basket- -balls), and even a fetus (a plush toy calf). Each child was able to palpate for the calf, and to hear their own heartbeat with a stethoscope. There were veterinary tools, models of animals and real cow bones to explore. More information on the 9th annual Fresno Farm and Nutrition Day can be found at the following: Fresno Bee article, Fresno Bee video, Ag News Network video, UC CalFresh Fresno County blog, PBS video, AgNet West video and article, http://www.vmtrc.ucdavis.edu/blog/?cat=7, and the UCDVMTRC Facebook page. Students at the 2014 Fresno County Farm and Nutrition Day learning about good eating habits. Students at the 2014 Fresno Farm and Nutrition Day planting leaf lettuce to take home and grow. 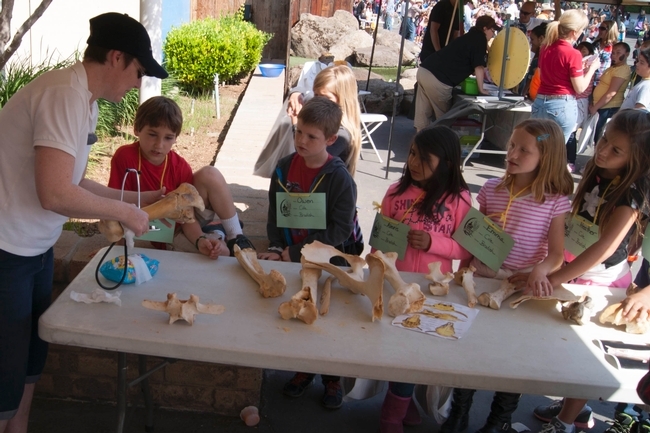 Chidren at the 2014 Fresno Farm and Nutrition Day examing cow bones. Be on the lookout for spotted wing drosophila. It's cherry growing season and a good time to begin looking for spotted wing drosophila (SWD), Drosophila suzukii. SWD is a small fruit fly that attacks soft-flesh fruit such as cherry, blueberry, raspberry, and blackberry. 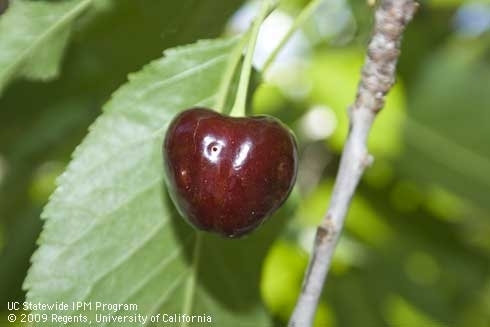 It first appeared in 2010, and its damage to fruit and increased management costs led to significant economic losses to cherry growers throughout California and the Pacific Northwest. Unlike other fruit flies that infest rotted fruit, SWD attacks undamaged fruit. As cherry fruit begins to develop and starts to change color from light green to straw, SWD lays its eggs just under the skin of fruit, creating a small scar or a “sting.” One to three larvae may develop inside each cherry, feeding on the fruit and causing it to become brown and soft. Many times SWD flies are not noticed until fruit is mature, and by that time management is not very effective. Prevention is the key, and one way to prevent damage is to monitor for the pest when it first becomes active. SWD can be monitored with several types of traps partly filled with apple cider vinegar to lure the pest. Monitor traps weekly through the end of harvest, and be sure to confirm the presence of SWD, as other Drosophila spp. may be present in trap catches. SWD males have a single dark spot on the tip of its wing and females have a large ovipositor. 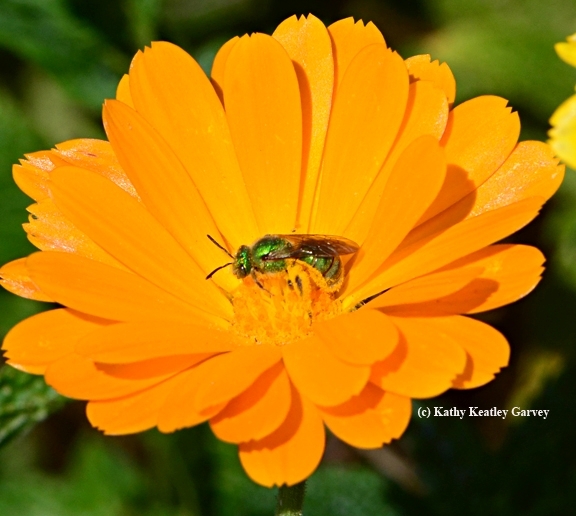 See the UC IPM Pest Management Guidelines for identification help and a dichotomous key. 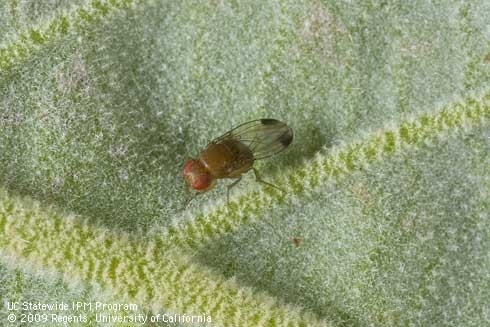 Spotted wing drosophila is still a relatively new pest, and management information continues to change. 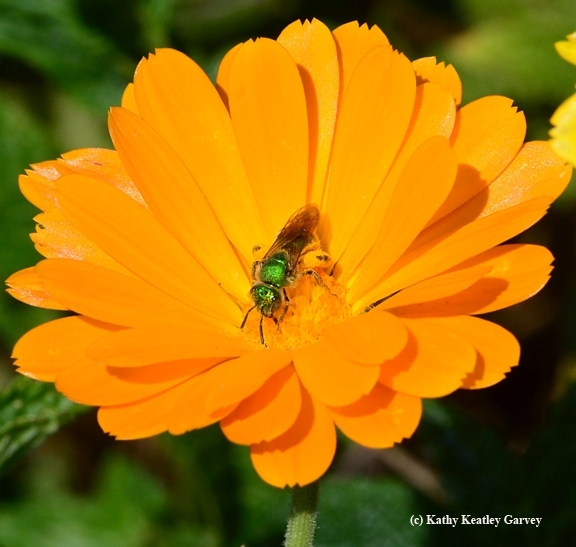 UCCE Entomology Advisor David Haviland and other researchers have been working to provide what help they can. Haviland has designed a bucket trap called the “Haviland trap” and is working with others to field-test experimental lures for SWD. He's also studying a possible biological control agent. Research has led to new grower guidelines so that early season cherries can be produced and sold internationally. Check out the 2014 Recommendations for Sweet Cherry (PDF). For management in backyard cherries or other urban areas, see the SWD Pest Note. For more information about UC IPM's recent work, see the 2013 Annual Report. An image of a spotted wing drosophila. A cherry with spotted wing drosophila damage. 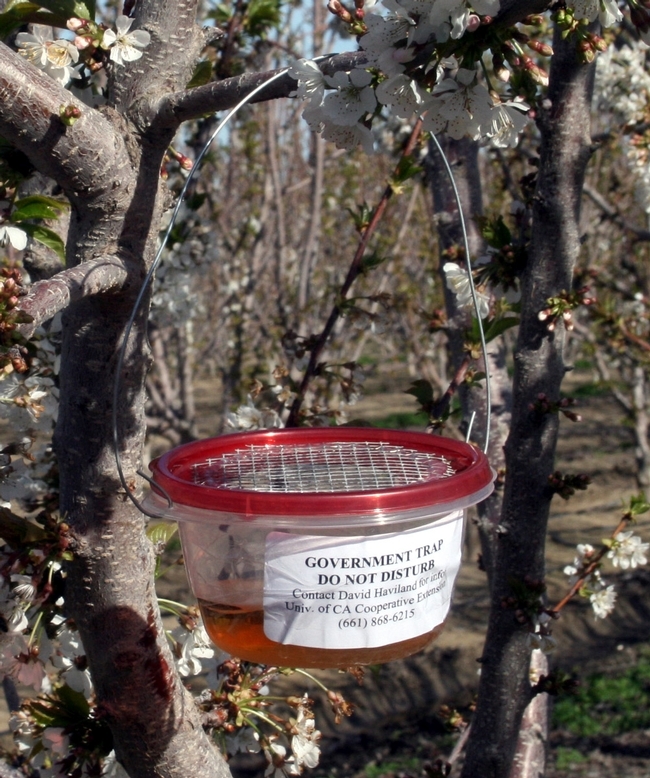 A trap used to monitor for the presence of spotted wing drosophila.